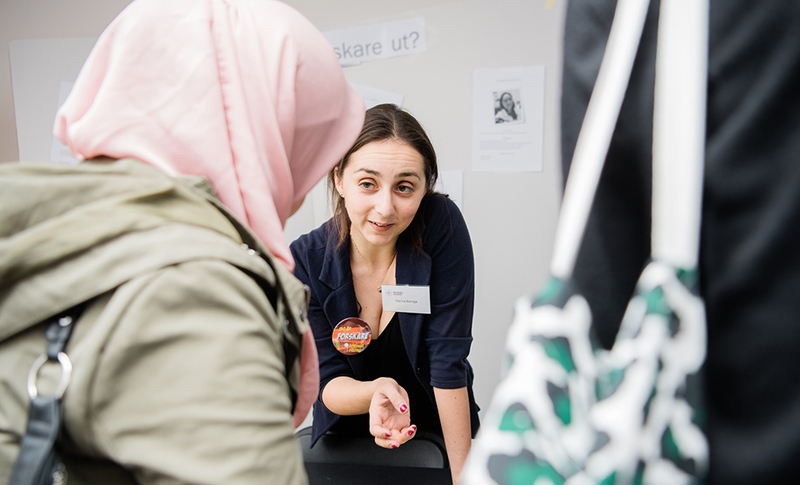 Hanna Barriga, researcher at Karolinska Institutet in Stockholm, talks with a visitor at ForskarFredag Stockholm 2018. Photo: Erik Cronberg. Designed to showcase what researchers do and why it matters, the event in Sweden, known as ForskarFredag, attracted 17,000 visitors and engaged more than 550 researchers. School pupils and members of the public were invited to participate in hundreds of free hands-on activities, experiments, shows, discussions and guided tours in venues ranging from cafés, libraries and shopping centres to museums, high-tech laboratories and science centres. ForskarFredag (Researchers’ Friday) is Sweden’s most widely dispersed science festival, reaching towns in remoter parts of the country that rarely have access to this type of science event. For the first time, activities were also held on the Saturday, allowing more members of the public to participate. One of the main aims of European Researchers’ Night is to spark young people’s interest in science and inspire them to consider a career in research. All of the Swedish cities offered opportunities to meet researchers in various activities, with topics ranging from stem cells, neuroscience and space to cultural heritage, archaeology and democracy, as well as ask them questions about their everyday work. In a number of cities, researchers from the Youth Academy of Sweden took school classes on a voyage of scientific discovery in Expedition Mundus, in which pupils were challenged to investigate a fictional planet whilst developing their scientific skills. To engage schools that might not be able to travel to activities, there was also an opportunity to “Borrow a researcher” to come talk to pupils in their classroom, which was taken up by more than 70 classes. In addition, 8,000 pupils across Sweden have been photographing ladybirds as part of this year’s ForskarFredag’s mass experiment. The photos will help researchers at the Swedish Museum of Natural History, to train an app to recognise species of ladybird found in Sweden and contribute to research in the field of biodiversity. ForskarFredag Stockholm 2018. Photo: Erik Cronberg. 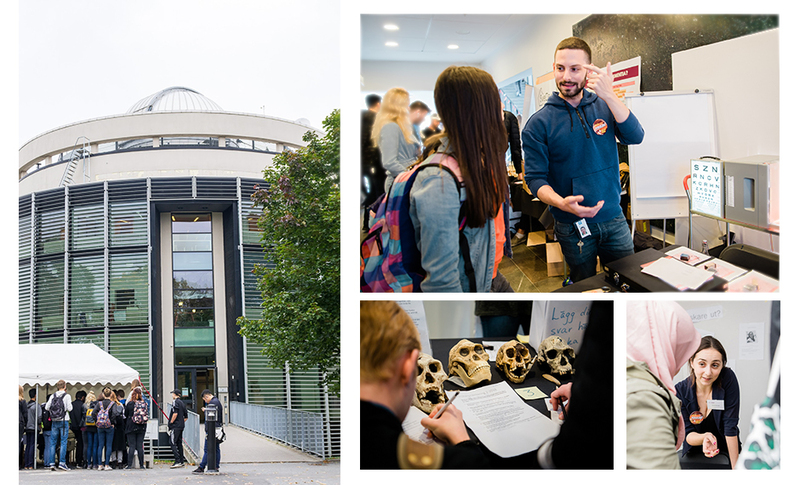 4,300 pupils participated in activities at AlbaNova University Centre and House of Science in Stockholm on the Friday, including an exhibition with hands-on activities, physics shows, and presentations from some of Stockholm’s top researchers. Balthazar Science Centre, ForskarFredag Skövde 2018. Photo: Cecilia Fransson, ASSAR. 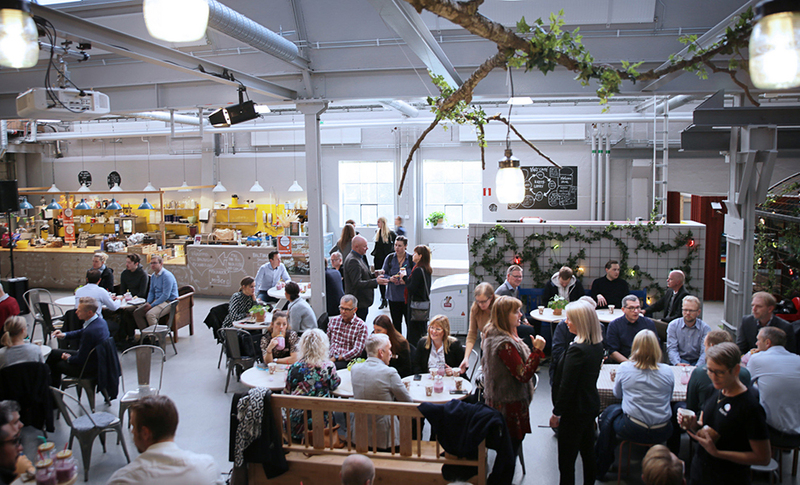 In Skövde, visitors could hear from researchers about the latest developments in digitalisation, sustainability and artificial intelligence over breakfast in Balthazar Science Centre’s café. Activities for the whole family at Umeå University during ForskarFredag 2018. Photo: Mattias Pettersson, Inhousebyrån, Umeå universitet. 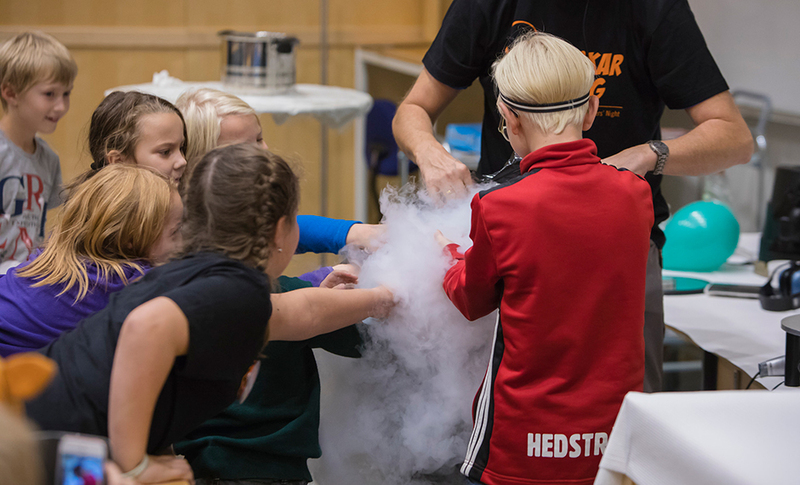 Umeå’s programme of activities, talks and experiments held at Umeå University featured a very popular physics and chemistry show, where children were shown how clouds form. The solar park “Solvåg” in Piteå. Photo: Mikael Sundkvist. ForskarFredag in Piteå was held for the first time at Piteå Science Park. 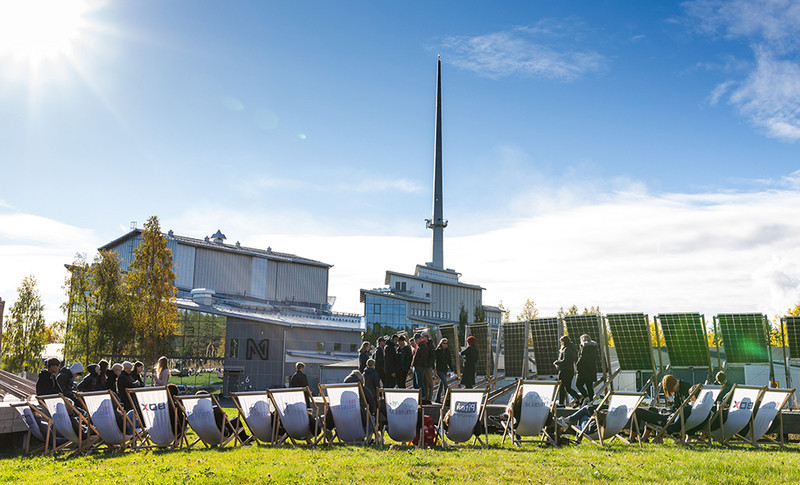 On the Saturday, the public were given special tours by researchers of Solvåg solar park, a world-class facility for solar energy research in cold climate and carries out research in the fields of architecture, technique, energy and design while also serving as an accessible open green park and social meeting place within an urban environment. 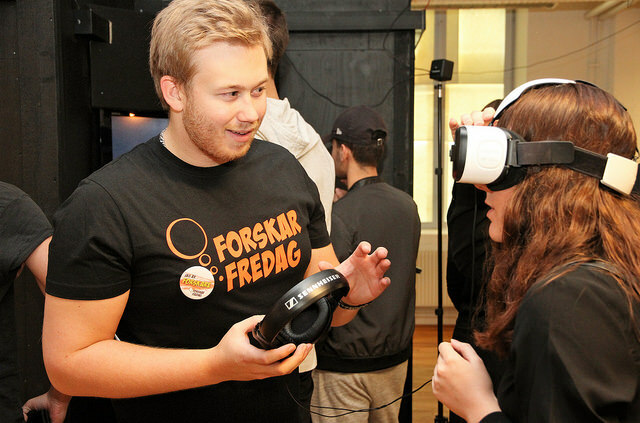 In Blekinge, upper secondary schools were invited to Kreativum Science Centre to try out masses of activities including virtual reality, coding and learning how artificial intelligence can be used to solve crimes. 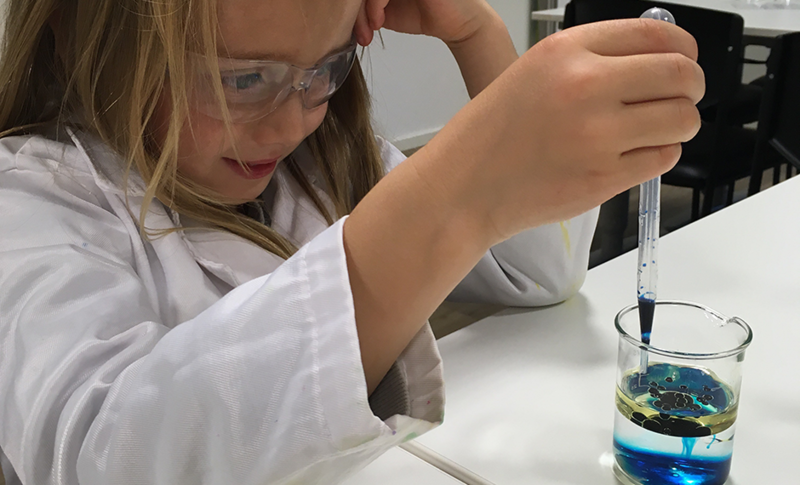 Dalarna’s school programme was followed by afternoon and evening activities for families at 2047 Science Centre, where hands-on activities included lego programming, virtual reality, chemistry experiments and star gazing. Cultural heritage day at Vänermuseet, ForskarFredag 2018. Photo: Sandra Wall. 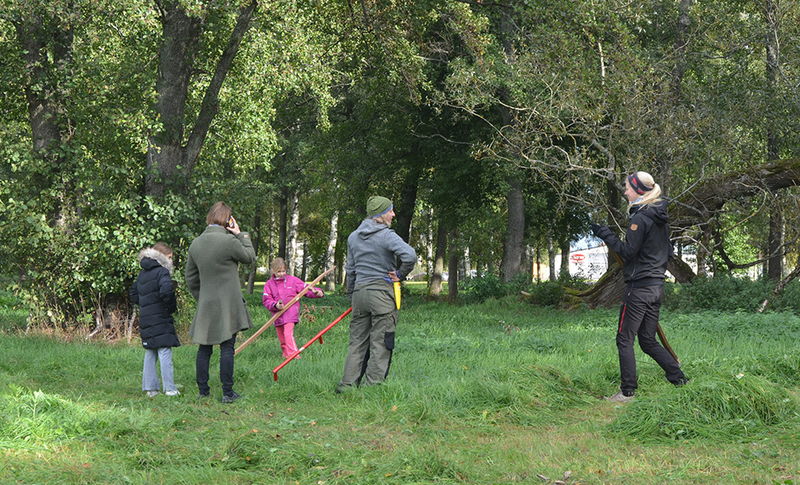 The museum Vänermuseet invited families to a cultural heritage day where the visitors could learn about traditional methods of haymaking and have a go with a scythe. 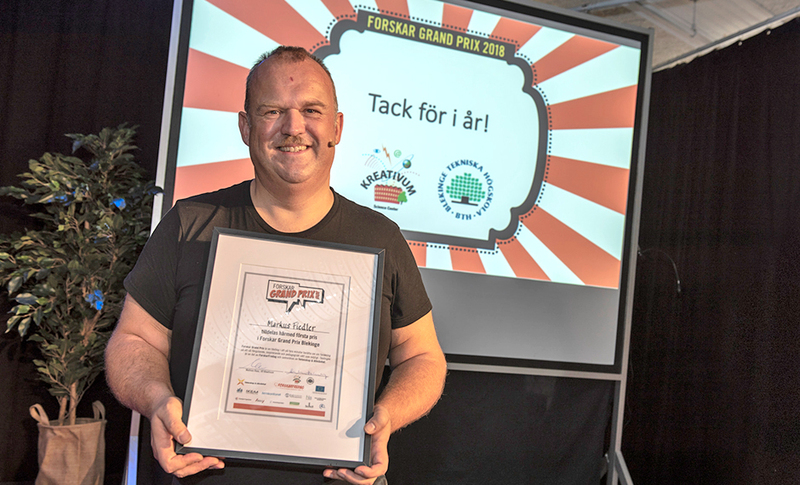 Markus Fiedler, researcher at Blekinge Institute of Technology and the winner of Researchers’ Grand Prix in Blekinge at ForskarFredag 2018. Photo: Joakim Lenell. Six cities also held regional heats of Researchers’ Grand Prix, a fast–paced and engaging contest in which researchers are challenged to present their research to a public audience in just four minutes. The audience along with expert juries could vote to decide the winners, who go on to compete in the national final in November. ForskarFredag is coordinated by the Swedish non-profit organisation VA (Public & Science) and organised in participating cities by universities, science centres, museums, research centres, municipalities, science parks and regional development councils. It’s the most widespread research festival in Sweden. A short film about this year’s event in Stockholm can be found here. European Researchers’ Night is a Europe-wide initiative that takes place on the last Friday night of September every year. European Researchers’ Night in Sweden is funded by the European Commission under HORIZON 2020 in the framework of the Marie Sklodowska Curie actions, GA 818421, together with our Swedish partners.